The LGV20 has been launched in India. The South Korean company's dual-display phone, with a 32-bit Hi-Fi Quad DAC was originally launched in September, at the IFA 2016, in Berlin. The LG V20's design uses a combination of Aluminum for the body, while the top and bottom are made of Silicone Polycarbonate. The phone sports a 5.7 inch 2560 x 1440p Quad HD Quantum display with Corning Gorilla Glass 4, and a pixel density of 513 PPI. On the top of the main display, is a 160 by 1040 ticker display, which has the same pixel density. This is used for quick shortcuts for apps, sending quick replies, and for displaying notifications, which can be expanded with a tap. 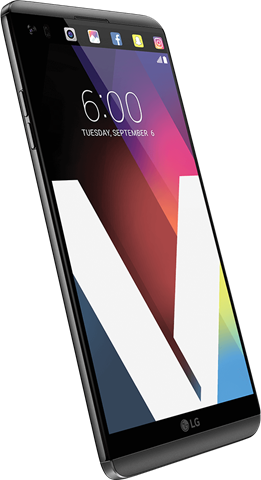 The V20 runs on Android 7.0 Nougat, and was the first phone to do so, before Google launched the Pixel devices. 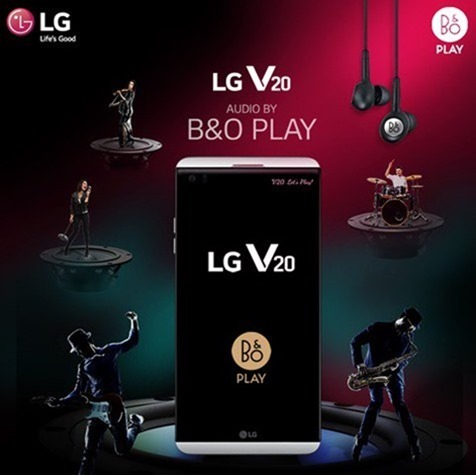 The LG V20 is powered by a Qualcomm Snapdragon quad core processor, along with 4GB of RAM. The phone has 64GB of onboard storage, and an expandable memory option in the form of a microSD card slot, which supports up to 2TB of storage. The selfie lens on the LG V20 is a 5 megapixel camera with an f/1.9 aperture, and a 125° wide-angle lens which also supports 83°normal angle mode. The V20 features a fingerprint scanner on the back panel. Another highlight of the phone is the audio chip, which is a 32-bit Hi-Fi Quad DAC ESS Sabre ES9218, combined with Bang & Olufsen’s B&O Play for a superior audio experience, and three microPhones for recording audio even in loud scenarios, like sporting events. 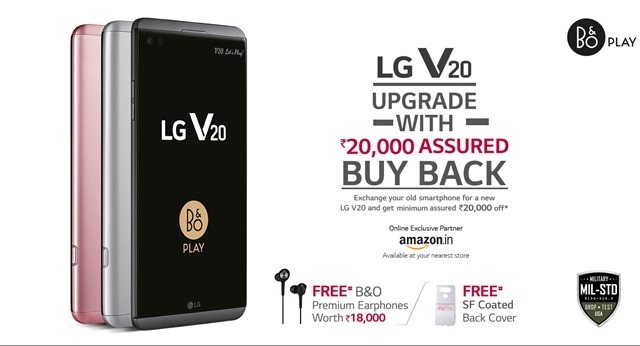 The LG v20 has been priced at Rs. 54,999 in India, and will be sold exclusively via Amazon India. The phone comes with a pair of B&O premium earbuds worth Rs. 18000 (please refer to Amazon India’s website).